Inshore water temperatures on the north end of the Grand Strand have dropped into the low to mid-50s, and the water is still gin clear. 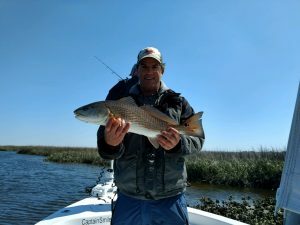 Even though water temperatures are heading in the wrong direction, Captain Patrick “Smiley” Kelly (843-361-7445) reports that redfish are in very shallow water feeding. With a stealthy approach via trolling motor his boat has caught some nice 15-27 inch fish for two hours on each side of low tide. The reds are very shallow, with some in 1 foot of water or less and others in 4-5 foot deep potholes. On the low tide mud flats you can see them pushing up a wake or creating mud clouds, and they are usually in the same areas as large mullet. Gulp! or mud minnows on a ¼ ounce jighead have been working great. There have also been some black drum caught on the low to rising tide in about 6 feet of water on ledges or docks along the main river. Fresh cut shrimp and crabs have been working well. Fishermen are reminded that, as a precautionary measure, the SCDNR is asking anglers to practice catch and release of all spotted seatrout through the end of September. To read the full news release click here. Inshore water temperatures on the north end of the Grand Strand are up to 60-63 degrees, and the shallows are still very clear. 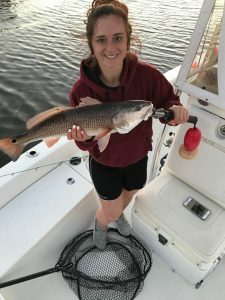 Inshore fishing is picking up around Little River, and Captain Patrick “Smiley” Kelly (843-361-7445) reports that on the low to rising tide they have been doing well for redfish in the 18-27 inch range. Fish are being caught on both Gulp! and live mud minnows in the tidal marshes off the IntraCoastal Waterway. They are also catching a few black drum on crabs and shrimp on the incoming tide around the ledges in 6-15 feet of water. 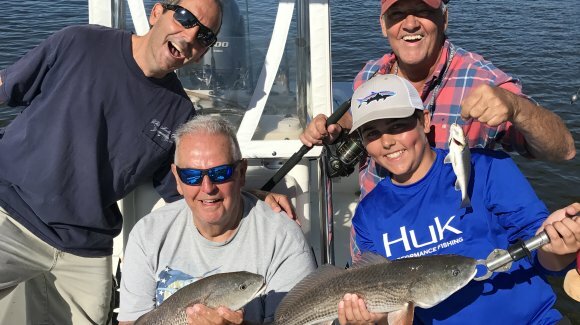 While the expectation is that numbers are way down, there have been some reports of trout being caught – including this 18-inch fish. Anglers are reminded that, as a precautionary measure, the SCDNR is asking anglers to practice catch and release of all spotted seatrout through the end of September. To read the full news release click here.